A case study published in the Journal of Upper Cervical Chiropractic Research on Oct. 21, 2014, documents the case of a chiropractic patient being helped with fibromyalgia. According to the Mayo Clinic's website, "Fibromyalgia is a disorder characterized by widespread musculoskeletal pain accompanied by fatigue, sleep, memory and mood issues." The authors of this study point out that more than 5 million adult Americans are affected by fibromyalgia. Patients with fibromyalgia have an amplification of their pain as well as a heightened perception of pains that may not normally be felt by others. 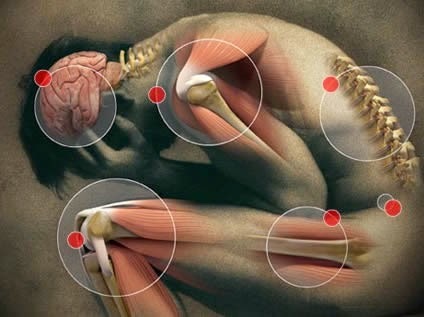 Sleep disorders are also common in these cases and contribute to the pain problems experienced by fibromyalgia sufferers. In this study, a 31-year-old woman went to the chiropractor after suffering with diagnosed fibromyalgia for two and a half years. Her chief complaint was constant back pain and shooting pain down her legs. Her history also showed that she had been suffering with headaches 3-4 times a week, depression, fatigue, loss of balance, ringing in the ears, visual stars, chronic sinus infections, dry mouth, acid reflux, painful periods, excessive sleeping, constipation, and hemorrhoids. A chiropractic examination with thermographic studies and spinal x-rays was performed. The x-rays showed multiple areas of spinal bone malpositions including a loss of the normal neck curvature and a head position that was more forward than normal. It was determined that the woman had vertebral subluxation causing nerve system interference. From this finding, a course of specific chiropractic adjustments was begun. After her first chiropractic adjustment, the woman reported a 40 percent reduction in her pain. The study records that one month into her care, the woman described improvement in her back pain, headaches, leg pain, sciatica, and constipation. A few weeks later, she stated that her sciatic pain, back pain, and knee and foot pain had all improved, and her pain had decreased 80 percent since starting chiropractic care. At this point, she took herself off all pain medications.